People often ask me why I like travelling to Eastern Europe. Thus far, I have managed to avoid the answer ‘Because it’s there’ in favour of a more considered response that involves three parts. Firstly, if one considers Europe to the west of Russia, there are many places that can be reached in about three hours or less from the UK. Secondly, few parts of Eastern Europe are particularly expensive for the westerner. Thirdly, while many cities are becoming increasingly westernised, there is a distinctly different culture. All of these factors make this part of the continent appealing. One such place is Kyiv. It could, even, be described as a bit odd, certainly to western eyes. This is intended as a compliment rather than an insult. It assuredly fits all three of the criteria invoked above, being a three-hour flight from Gatwick, inexpensive and with a style of its own. The fact that Ukraine uses the Cyrillic alphabet helps the western visitor to feel that they are somewhere different. It’s useful to learn the letters, as street signs and directions are all shown in Cyrillic. In fact, it’s better to use a Cyrillic map rather than one printed in Latin script as the latter will often show a translated version and it’s all too easy to be fooled. The Cyrillic alphabet is similar to the Greek and might look a little intimidating at first, but really, it’s quite easy. If the Cyrillic alphabet is easy enough to comprehend, the same cannot be said for Soviet-style architecture. Perhaps architects were only allowed to design buildings after they had imbibed a certain quota of vodka. In the case of the Hotel Turist, the quota seems to have been almost as high as the hotel itself, which climbs to twenty-seven storeys. One should not be deterred by appearances, as the interior is far more attractive, the rooms are comfortable enough and the staff are helpful. One pleasing quirk – Kyiv has many – is that there are four lifts, two of which carry you to odd-numbered floors while the other two deal with the even numbers. Convention is also defied by having staff on each floor to hold room keys, rather than the main reception. The guest is left hoping that the person responsible for keys on their floor has not wandered away for a chat or an extensive toilet break. A slight drawback is that the hotel is situated on the other side of the Dnepr river from the city centre. Another Kyiv oddity; there are no footbridges. This is not a problem, however, as the hotel is next to Livoberezhna metro station and metro journeys cost a few pence. Having a splendid view of both the city and the metro station from a twenty-third floor room, it was quickly possible to discern that metro trains run approximately every ninety seconds. Even with such incredibly frequent services, finding a seat on a metro train is a rare luxury, a testament to its popularity. A journey from Livoberezhna to the city centre only takes a few minutes, though one should be prepared to double the journey time because the stations in the centre are so far underground. Reaching the top of the first escalator for the first time, you feel a sense of relief at having made it to what you assume is the summit, only to realise that there is now a second escalator of exactly the same proportion to negotiate. Something else that can be seen from the hotel room, and indeed from most places in the city, is the Motherland Monument, a very large stainless steel woman wielding a sword and a shield. At over a hundred metres tall, the monument is not subtle. 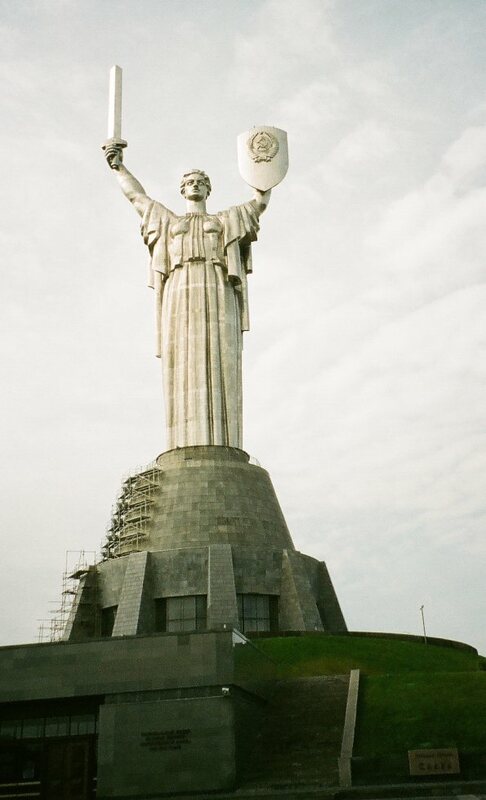 The statue is located in the modestly-named Park of Eternal Glory, amid a museum complex and as one approaches, there are strains of Soviet military music, interspersed with typical Ukrainian folk music, which has its own stirring qualities, dipping into a slow, mournful pace and suddenly bursting into vibrant life. As you progress through this area, you pass tanks, other military hardware and sculptures in Soviet-realist style. It’s all just another example of the sometimes surreal experience of Kyiv. 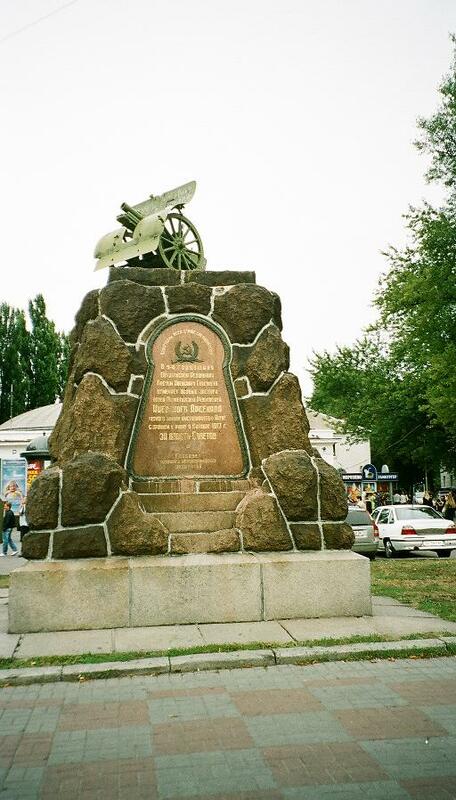 Kyiv, like many cities in Eastern Europe, has myriad green spaces and a stroll to the Motherland Monument can be incorporated into a full day of interesting exploration in and around the park. 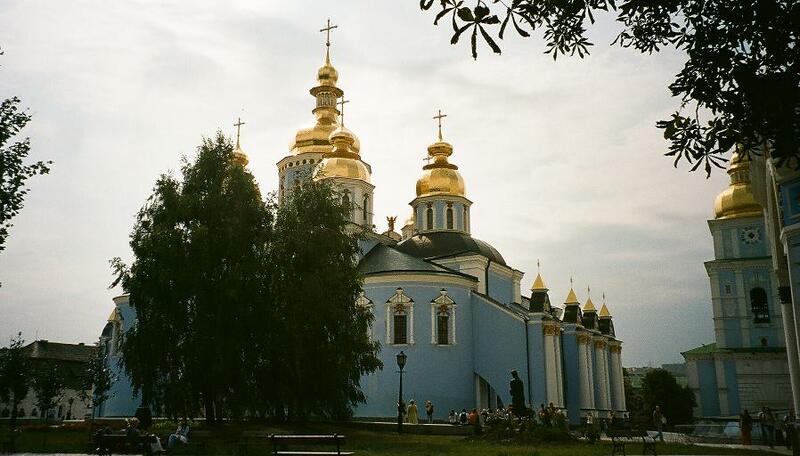 The park is the setting for Pechersk Lavra, Kyiv’s famous Monastery of the Caves, first settled in the eleventh century. A typical Orthodox church, with its golden onion-domes, stands above the site. The Botanic Garden is also nearby and a simple walk in the park is pleasant enough, with abundant birdlife to be seen. Woodpeckers and jays can be seen in the wooded parts, seemingly determined to live up to a Kyiv-style zaniness by chattering and screeching loudly in the case of the jays and battering manically on tree trunks in the case of the woodpeckers. Football aficionados should pay a visit to the Dynamo Stadium, home of Dynamo Kyiv. 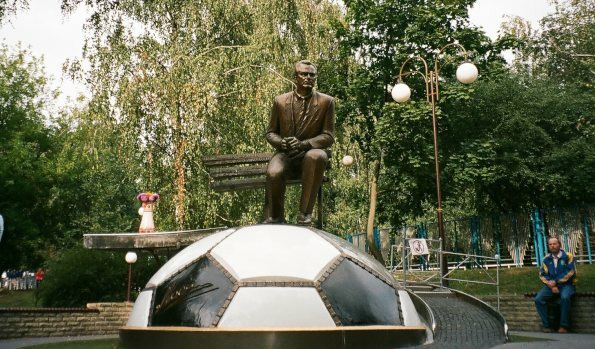 Even if there is no match on during your visit, it’s worth seeing for the museum and the statue of the legendary Valeriy Lobanovskiy, native of Kyiv, coach of Dynamo and three-times coach of the Soviet Union team. If there is a game, prices will vary depending upon the opposition, but even the more expensive tickets will appear astonishingly cheap, certainly for those used to English Premier League prices. Any Arsenal supporters are also advised to take the metro to Arsenalna station, which is a ten-minute walk from the ground. A small cannon sculpture outside the station is a perfect replica of the London club’s crest. Visitors to Arsenalna can also claim that they have been to Europe’s deepest underground station. Overall, Kyiv’s quirks, oddities and strangeness are endearing qualities. The city, for westerners, is very cheap and a good meal with a few drinks should be easily obtainable for ten pounds or less. You also stand a good chance of being presented with a free glass of vodka at the end of a meal and it is most impolite to refuse the offering. Beer drinkers will find a good range of beer styles, but should remember that beer tends to be quite strong in many countries in Eastern Europe. A ‘low-strength’ beer means that the beer is less than around 5% ABV, so a ‘light’ beer can, in fact, be something considerably stronger than a British best bitter. There are certain foods in any country that everybody should try once. For example, it feels almost obligatory to taste burek in Balkan countries and in Ukraine, the dish to sample is borsch. Many people – mistakenly – think of this as merely beetroot soup. Borsch is soup that contains beetroot, an important difference. The beetroot is added towards the end of the cooking process to enhance flavour and colouring, but is not the basis for the soup. The ingredients can vary considerably and it is perfectly possible for vegetarians to enjoy a meat-free version. A small test to see if your borsch is of the right thickness is to place a spoon on top of the soup. If the spoon remains resting on top, then you have the good stuff. Kyiv has some excellent museums and galleries to suit all kinds of cultural interest, but naturally comes up with something unusual. There are museums dedicated to water, bread, toilets and trolleybus tickets, although the last-named is actually a pub with a collection of trolley-related photos, tickets and posters around the walls. Disappointingly, however, the Museum of Bee Breeding appears to have closed down. Finally, a question: Kyiv or Kiev? I have used the former throughout this article for the simple reason that it is the preferred Ukrainian version. This is the spelling that you see throughout the city, or at least the way it translates from Cyrillic. Kiev is the Russian version and it seems much more respectful to use the Ukrainian spelling. Ensuring that you emphasise the –iv in the second syllable should bring the reward of a smile and even, perhaps, another glass of vodka. This entry was tagged Kiev, Kyiv, Ukraine. Bookmark the permalink.